Below are wooden rocking horses, and a few other types of rocking horses (such as plush), for sale. Wood rocking horses are commonly made from a variety of different woods including oak, pine, and others. Some are even made from bamboo, which is actually a type of woody grass. 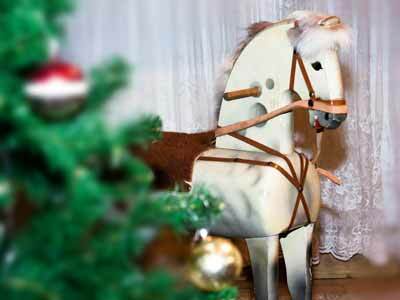 Below: A wooden rocking horse with leather saddle by a Christmas tree. The wooden rocking horses below are a combination of ridable-sized rocking horses, and smaller ones meant to be used for display. The wooden rocking horses below are a combination of ridable-sized rocking horses, and also smaller ones made for decoration or display. 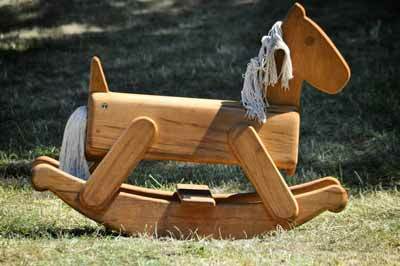 The modern style of wooden rocking horse began to evolve in the 1600s. While earlier styles of rideable toy horses date back to much earlier, it was in the 1600s that wood rocking horses on long, bowed, wood rockers started to become popular. The oldest known modern-style wooden rocking horse in existence is believed to have belonged to King Charles I of England (1600 - 1649). It is currently owned by the Victoria and Albert Museum in London. Wooden rocking horses gained in popularity throughout Europe and America. Originally, they were mostly affordable only to the upper-class, but over time became affordable to people in lower income brackets as well. 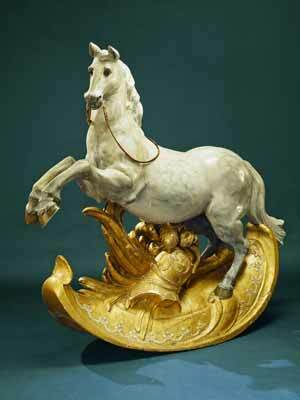 Below: A wooden (birch) rocking horse on a gilded stand. It was possibly a childhood toy of Gustav III of Sweden (1746 – 1792). It is approximately 5 feet, 5 inches tall. The above image is in the public domain: PD-US-expired. Below: A wooden rocking horse with yarn for a mane and tail. If you find a wooden rocking horse you like but you're not ready to purchase it right away, you can always add it to your shopping cart so it will be easy to find later. In most cases, Amazon.com will keep track of your rocking horse, and anything else in your shopping cart, for 90 days. In the meantime, if you want to check out with other items, click "Save for later" to move the rocking horse (or other items) to a separate, but still easy-to-find list beneath your shopping cart.